The rich array of microbiota in our intestines can tell us more than you might think. Eighteen vials were rocking back and forth on a squeaky mechanical device the shape of a butcher scale, and Mark Lyte was beside himself with excitement. ‘‘We actually got some fresh yesterday — freshly frozen,’’ Lyte said to a lab technician. Each vial contained a tiny nugget of monkey feces that were collected at the Harlow primate lab near Madison, Wis., the day before and shipped to Lyte’s lab on the Texas Tech University Health Sciences Center campus in Abilene, Tex. Lyte’s interest was not in the feces per se but in the hidden form of life they harbor. The digestive tube of a monkey, like that of all vertebrates, contains vast quantities of what biologists call gut microbiota. 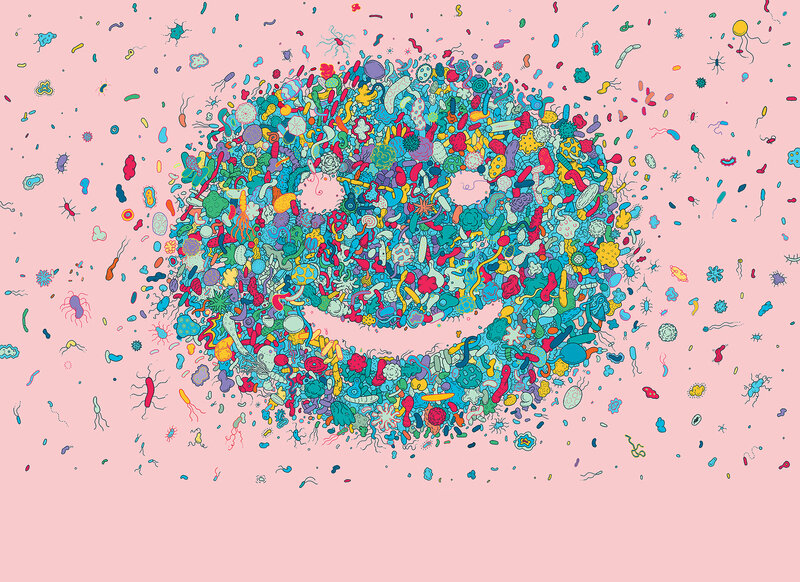 The genetic material of these trillions of microbes, as well as others living elsewhere in and on the body, is collectively known as the microbiome. Taken together, these bacteria can weigh as much as six pounds, and they make up a sort of organ whose functions have only begun to reveal themselves to science. Lyte has spent his career trying to prove that gut microbes communicate with the nervous system using some of the same neurochemicals that relay messages in the brain. Given the extent to which bacteria are now understood to influence human physiology, it is hardly surprising that scientists have turned their attention to how bacteria might affect the brain. Micro-organisms in our gut secrete a profound number of chemicals, and researchers like Lyte have found that among those chemicals are the same substances used by our neurons to communicate and regulate mood, like dopamine, serotonin and gamma-aminobutyric acid (GABA). These, in turn, appear to play a function in intestinal disorders, which coincide with high levels of major depression and anxiety. Last year, for example, a group in Norway examined feces from 55 people and found certain bacteria were more likely to be associated with depressive patients. At the time of my visit to Lyte’s lab, he was nearly six months into an experiment that he hoped would better establish how certain gut microbes influenced the brain, functioning, in effect, as psychiatric drugs. He was currently compiling a list of the psychoactive compounds found in the feces of infant monkeys. Once that was established, he planned to transfer the microbes found in one newborn monkey’s feces into another’s intestine, so that the recipient would end up with a completely new set of microbes — and, if all went as predicted, change their neurodevelopment. The experiment reflected an intriguing hypothesis. Anxiety, depression and several pediatric disorders, including autism and hyperactivity, have been linked with gastrointestinal abnormalities. Microbial transplants were not invasive brain surgery, and that was the point: Changing a patient’s bacteria might be difficult but it still seemed more straightforward than altering his genes. When Lyte began his work on the link between microbes and the brain three decades ago, it was dismissed as a curiosity. By contrast, last September, the National Institute of Mental Health awarded four grants worth up to $1 million each to spur new research on the gut microbiome’s role in mental disorders, affirming the legitimacy of a field that had long struggled to attract serious scientific credibility. Lyte and one of his longtime colleagues, Christopher Coe, at the Harlow primate lab, received one of the four. ‘‘What Mark proposed going back almost 25 years now has come to fruition,’’ Coe told me. ‘‘Now what we’re struggling to do is to figure out the logic of it.’’ It seems plausible, if not yet proved, that we might one day use microbes to diagnose neurodevelopmental disorders, treat mental illnesses and perhaps even fix them in the brain. For several weeks, the team, led by John Cryan, the neuroscientist who designed the study, fed a small group of healthy rodents a broth infused with Lactobacillus rhamnosus, a common bacterium that is found in humans and also used to ferment milk into probiotic yogurt. Lactobacilli are one of the dominant organisms babies ingest as they pass through the birth canal. Recent studies have shown that mice stressed during pregnancy pass on lowered levels of the bacterium to their pups. This type of bacteria is known to release immense quantities of GABA; as an inhibitory neurotransmitter, GABA calms nervous activity, which explains why the most common anti-anxiety drugs, like Valium and Xanax, work by targeting GABA receptors. Cryan found that the mice that had been fed the bacteria-laden broth kept swimming longer and spent less time in a state of immobilized woe. ‘‘They behaved as if they were on Prozac,’’ he said. ‘‘They were more chilled out and more relaxed.’’ The results suggested that the bacteria were somehow altering the neural chemistry of mice. It has long been known that much of our supply of neurochemicals — an estimated 50 percent of the dopamine, for example, and a vast majority of the serotonin — originate in the intestine, where these chemical signals regulate appetite, feelings of fullness and digestion. But only in recent years has mainstream psychiatric research given serious consideration to the role microbes might play in creating those chemicals. Lyte’s own interest in the question dates back to his time as a postdoctoral fellow at the University of Pittsburgh in 1985, when he found himself immersed in an emerging field with an unwieldy name: psychoneuroimmunology, or PNI, for short. The central theory, quite controversial at the time, suggested that stress worsened disease by suppressing our immune system. By 1990, at a lab in Mankato, Minn., Lyte distilled the theory into three words, which he wrote on a chalkboard in his office: Stress->Immune->Disease. In the course of several experiments, he homed in on a paradox. When he dropped an intruder mouse in the cage of an animal that lived alone, the intruder ramped up its immune system — a boost, he suspected, intended to fight off germ-ridden bites or scratches. Surprisingly, though, this did not stop infections. It instead had the opposite effect: Stressed animals got sick. Lyte walked up to the board and scratched a line through the word ‘‘Immune.’’ Stress, he suspected, directly affected the bacterial bugs that caused infections. To test how micro-organisms reacted to stress, he filled petri plates with a bovine-serum-based medium and laced the dishes with a strain of bacterium. In some, he dropped norepinephrine, a neurochemical that mammals produce when stressed. The next day, he snapped a Polaroid. The results were visible and obvious: The control plates were nearly barren, but those with the norepinephrine bloomed with bacteria that filigreed in frostlike patterns. Bacteria clearly responded to stress. Then, to see if bacteria could induce stress, Lyte fed white mice a liquid solution of Campylobacter jejuni, a bacterium that can cause food poisoning in humans but generally doesn’t prompt an immune response in mice. To the trained eye, his treated mice were as healthy as the controls. But when he ran them through a plexiglass maze raised several feet above the lab floor, the bacteria-fed mice were less likely to venture out on the high, unprotected ledges of the maze. In human terms, they seemed anxious. Without the bacteria, they walked the narrow, elevated planks. Lyte went on to show how stressful conditions for newborn cattle worsened deadly E. coli infections. In another experiment, he fed mice lean ground hamburger that appeared to improve memory and learning — a conceptual proof that by changing diet, he could change gut microbes and change behavior. After accumulating nearly a decade’s worth of evidence, in July 2008, he flew to Washington to present his research. He was a finalist for the National Institutes of Health’s Pioneer Award, a $2.5 million grant for so-called blue-sky biomedical research. Finally, it seemed, his time had come. When he got up to speak, Lyte described a dialogue between the bacterial organ and our central nervous system. At the two-minute mark, a prominent scientist in the audience did a spit take. Lyte knew it was a dismissive question. And when he lost out on the grant, it confirmed to him that the scientific community was still unwilling to imagine that any part of our neural circuitry could be influenced by single-celled organisms. Lyte published his theory in Medical Hypotheses, a low-ranking journal that served as a forum for unconventional ideas. The response, predictably, was underwhelming. ‘‘I had people call me crazy,’’ he said. But by 2011 — when he published a second theory paper in Bioessays, proposing that probiotic bacteria could be tailored to treat specific psychological diseases — the scientific community had become much more receptive to the idea. A Canadian team, led by Stephen Collins, had demonstrated that antibiotics could be linked to less cautious behavior in mice, and only a few months before Lyte, Sven Pettersson, a microbiologist at the Karolinska Institute in Stockholm, published a landmark paper in Proceedings of the National Academy of Science that showed that mice raised without microbes spent far more time running around outside than healthy mice in a control group; without the microbes, the mice showed less apparent anxiety and were more daring. In Ireland, Cryan published his forced-swim-test study on psychobiotics. There was now a groundswell of new research. In short order, an implausible idea had become a hypothesis in need of serious validation. Late last year, Sarkis Mazmanian, a microbiologist at the California Institute of Technology, gave a presentation at the Society for Neuroscience, ‘‘Gut Microbes and the Brain: Paradigm Shift in Neuroscience.’’ Someone had inadvertently dropped a question mark from the end, so the speculation appeared to be a definitive statement of fact. But if anyone has a chance of delivering on that promise, it’s Mazmanian, whose research has moved beyond the basic neurochemicals to focus on a broader class of molecules called metabolites: small, equally druglike chemicals that are produced by micro-organisms. Using high-powered computational tools, he also hopes to move beyond the suggestive correlations that have typified psychobiotic research to date, and instead make decisive discoveries about the mechanisms by which microbes affect brain function. Two years ago, Mazmanian published a study in the journal Cell with Elaine Hsiao, then a graduate student and now a neuroscientist at Caltech, and others, that made a provocative link between a single molecule and behavior. Their research found that mice exhibiting abnormal communication and repetitive behaviors, like obsessively burying marbles, were mollified when they were given one of two strains of the bacterium Bacteroides fragilis. Mazmanian knew the results offered only a provisional explanation for why restrictive diets and antibacterial treatments seemed to help some children with autism: Altering the microbial composition might be changing the permeability of the intestine. ‘‘The larger concept is, and this is pure speculation: Is a disease like autism really a disease of the brain or maybe a disease of the gut or some other aspect of physiology?’’ Mazmanian said. For any disease in which such a link could be proved, he saw a future in drugs derived from these small molecules found inside microbes. (A company he co-founded, Symbiotix Biotherapies, is developing a complex sugar called PSA, which is associated with Bacteroides fragilis, into treatments for intestinal disease and multiple sclerosis.) In his view, the prescriptive solutions probably involve more than increasing our exposure to environmental microbes in soil, dogs or even fermented foods; he believed there were wholesale failures in the way we shared our microbes and inoculated children with these bacteria. So far, though, the only conclusion he could draw was that disorders once thought to be conditions of the brain might be symptoms of microbial disruptions, and it was the careful defining of these disruptions that promised to be helpful in the coming decades. An earlier version of this article described incorrectly the affiliation of Elaine Hsiao, an author of a study published in the journal Cell that linked bacteria to behavioral changes. At the time, she was a graduate student in the lab of Paul Patterson, another author of the study, not in the lab of Sarkis Mazmanian. Peter Andrey Smith is a reporter living in Brooklyn. He frequently writes about the microbial world. Reporting for this article was supported by the UC Berkeley-11th Hour Food and Farming Journalism Fellowship. A version of this article appears in print on June 28, 2015, on page MM46 of the Sunday Magazine with the headline: Gut Feelings. Darmflora verrijken? Microferm wordt als probiotica gebruikt. In het tijdschrift Groei & Bloei staan onder meer vragen van lezers die door ervaren tuiniers worden beantwoord. Dit keer een vraag over een aangetaste sering en het advies over het gebruik van EM. Met EM worden ziekteverwekkende micro-organismen in toom gehouden. Door meer nuttige microbiologie toe te voegen is er door ‘competitive exclusion’ minder (of geen ruimte) voor die ziekteverwekkers. De nuttige microbiologie heeft zo de overhand. 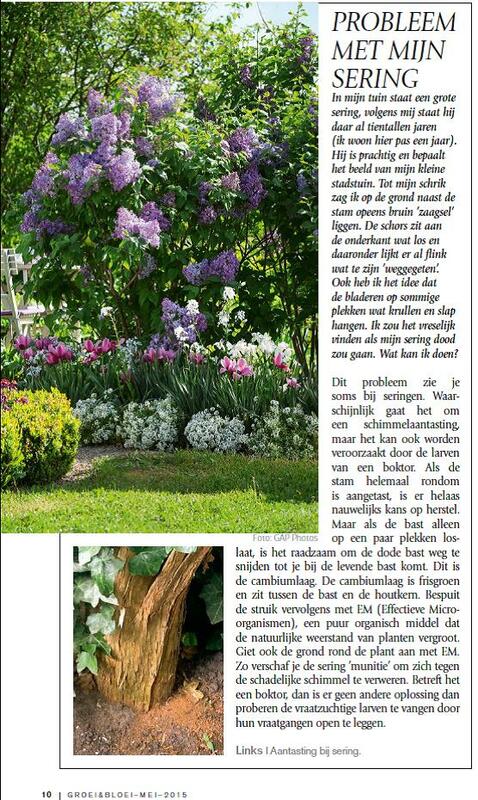 Zo creëer je een gezonde omgeving voor planten. Het product dat wordt gebruikt is EM-Actief (Microferm). Richtlijn is een maand lang, eenmaal per week toepassen. Daarna even kijken hoe het verloopt. Mocht er een terugval zijn dan kan je wellicht een papje maken met EM keramiek en dit aansmeren op de bast. 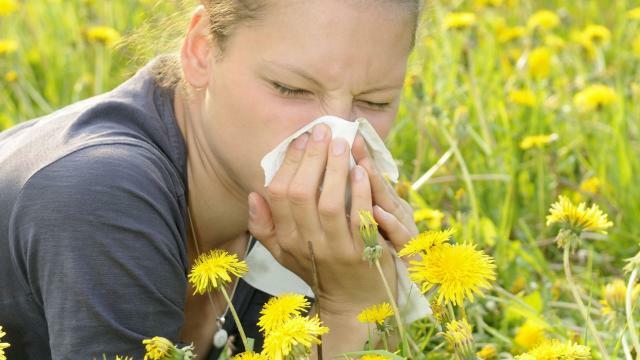 Mensen met hooikoorts of seizoensgebonden allergie zijn mogelijk gebaat bij probiotica. Dit blijkt uit een verzameling van verschillende studies naar dit onderwerp. Onderzoekers van het Vanderbilt Medical Center in Nashville bestudeerden 23 eerder uitgevoerde studies met in totaal 1.919 proefpersonen. Er wordt gedacht dat de toename in allergieën deels toe te schrijven valt aan een gebrek aan bacteriën in de darmen als gevolg van de schonere leefomstandigheden. Als je in een heel schone omgeving woont, kom je niet voldoende in contact met micro-organismen waardoor je immuunsysteem overuren gaat draaien als het in contact komt met onschadelijke allergenen. Probiotica zouden dit mogelijk kunnen verbeteren door de hoeveelheid goede bacteriën in het spijsverteringskanaal te vergroten. De kwaliteit van de onderzoeken varieerden. Mede daarom geven de wetenschappers aan dat meer onderzoek nodig is voor dat probiotica als behandeling kan worden geadviseerd bij hooikoorts. Van de studies die de onderzoekers bestudeerden, toonden zeventien een verbetering van de klachten of kwaliteit van leven door het gebruik van probiotica in vergelijking tot mensen die een placebo nuttigden. Binnen de overige zes onderzoeken werd echter geen verbetering gevonden. De resultaten van de review zijn veelbelovend, maar aangezien in de studies verschillende probiotica werden gebruikt binnen verschillende onderzoeksgroepen vinden de onderzoekers het te vroeg om probiotica daadwerkelijk aan te bevelen. De resultaten zijn gepubliceerd in het International Forum of Allergy & Rhinology. Het gebruik van probiotica zorgt er voor dat mensen minder piekeren. Daarmee zou het middel in de toekomst een aanvullende of preventieve therapie kunnen zijn tegen depressies. Dat blijkt uit onderzoek van de universiteiten van Amsterdam en Leiden, gepubliceerd in Brain, Behavior, and Immunity. Daarnaast is ook aangetoond dat probiotica mogelijk werken tegen migraine, zo wijst een nieuwe pilotstudie van de Universiteit van Wageningen uit. Dit is de eerste keer dat onderzocht is of het toedienen van probiotica werkt tegen piekeren. “Piekeren is het hebben van terugkerende gedachten over mogelijke oorzaken en gevolgen van iemands ellende en bedroefdheid”, legt onderzoeker Saskia van Hemert uit. “Bewezen is dat piekeren een indicator is van depressies; het is een van de meeste voorspellende kwetsbaarheidsfactoren van een depressie. Probiotica zou in de toekomst mogelijk een middel tegen depressies kunnen worden, aangezien uit het onderzoek blijkt dat probiotica piekeren kan voorkomen”, aldus van Hemert. Probiotica zijn levende bacteriën die, wanneer toegediend in adequate hoeveelheden, functioneel zijn in onder andere het verbeteren van de spijsvertering en het immuunsysteem. De onderzoeksgroep in het onderzoek piekerde na deze vier weken significant minder dan de controlegroep. Probiotica is niet alleen werkzaam tegen piekeren, ook migraines worden mogelijk verholpen door de micro-organismen. De onderzoeksgroep van de Universiteit van Wageningen zag het aantal migrainedagen met 25 procent afnemen. De hypothese is dat probiotica een positief effect hebben op de darmbarrière en daardoor migraine voorkomt. Verstoring van de darmbarrière zou namelijk migraineaanvallen kunnen uitlokken en het is bekend dat probiotica de darmbarrière kunnen versterken. Momenteel loopt er een nieuwe studie aan de Universiteit van Wageningen, waarin het positieve effect van probiotica op migraine nader onderzocht wordt. De resultaten van deze studie worden aan het eind van het jaar verwacht. Microferm (EM-Actief) wordt gebruikt als probiotica.